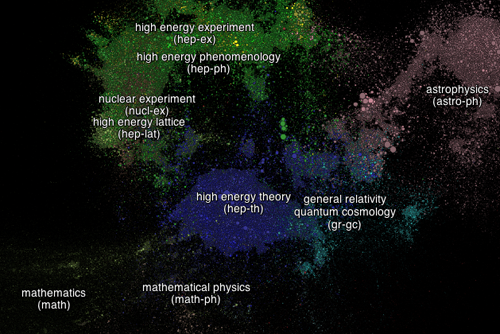 The arXiv is an electronic repository containing scientific papers, both published and as pre-prints, in the areas of physics, mathematics, computer science, mathematical biology, quantitative finance and statistics. That's a lot of areas and there are a lot of papers on the arXiv: over 860,000. But physicists Damien George and Rob Knegjens have got to grips with them all. They have constructed a clever algorithm to visualise the vast paper galaxy. As explained on their website, the algorithm is based on two "forces" that determine the papers' positions on a map based on citations between papers: "each paper is repelled from all other papers using an anti-gravity inverse-distance force, and each paper is attracted to all of its references using a spring modelled by Hooke's law." Each paper on the map is represented by a circle and the area of that circle is proportional to the number of citations the paper has. The result is not only pretty but also informative and interactive, showing how papers clump together and how different areas relate. Click here to use the map and to find out more. Click on the image to use the map.